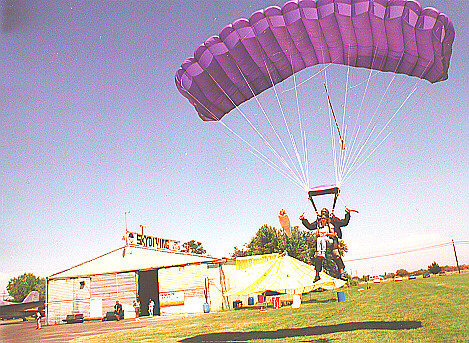 My love is for skydiving! It's awesome! I doubt there exists a more thrilling past time. 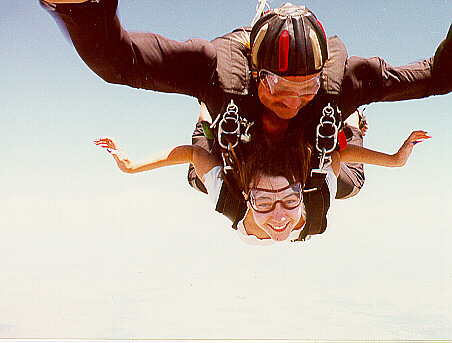 I tandem jump; that means I jump with an instructor (like most beginners). The adaptations I use sound funny but work; I tie my shoes together and strap my knees together. When I go to land I simply lift my legs with one hand and we land on our butts, besides a grass stain everything's great! I have been told that solo jumping is possible for some of us disabled. I have given learning the trade quite a bit of thought. However, I have come to the decision that in trying to learning I could REALLY do some damage to my body, so I think I'll settle for tandem. Snowskiing is definitely not one of the activities one thinks one of the disabled would excel at. I know when I first heard of this one I was a bit skeptical. I have been snow skiing since I was 8. The first few times I struggled with "normal" downhill and cross-country skiing; as my disease progressed "normal" skiing proved itself unrealistic. 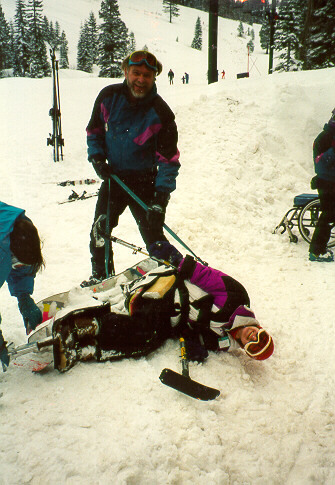 I found an adaptive ski school and skiing then became a sport I could enjoy. The ski school works with children and adults with any and all types of disabilities. The particular ski I use is called a "bi-ski"; it's two skis held very close together with a bucket seat sitting on them. I sit in the seat, which is close to the ground, and use my hand-held outriggers (short ski crutches) to steer. Shifting body weight is the key; it's a blast.